Red Flamingos by Patty Carroll. Patty Carroll’s highly intense, saturated color photographs have led to her recognition as one of Photolucida’s Top 50 Photographers (2104, 2017). 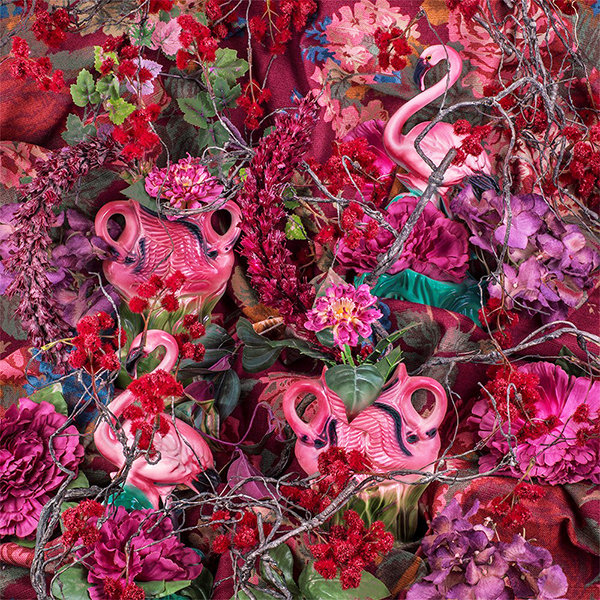 Flora & Fauxna is a still life series about women and their homes using decorative fabric, artificial flowers and ceramic birds to create a sumptuous, and often humorous, ornate world. Unlike traditional still life images, these photographs show no horizon line, dramatic lighting or symbols of death and decay. Birds in many cultures are messengers between heaven and earth, acting as a bridge between the mundane and spiritual life. In Carroll’s work, birds represent the human desire to escape gravity and reach the level of angels. Where: Gifts of Art Gallery — University Hospital Main Corridor, Floor 2.